SACRAMENTO, California, July 22, 2011 (ENS) – California Governor Jerry Brown today filed a brief asking a federal court to deny a request by an environmental group for an injunction to stop a solar power tower project in the Mojave desert. 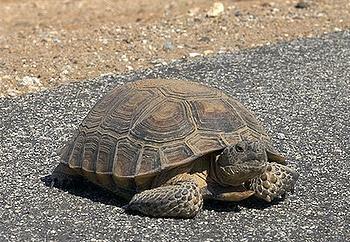 The Western Watersheds Project wants to halt the project due to the presence of desert tortoises at the site. The Ivanpah Solar Electric Generating System is a $2.2 billion solar thermal power project under construction in the Mojave Desert near the California-Nevada border, north of Ivanpah, California. The project has been approved by both state and federal officials. The 370 megawatt project is being developed by BrightSource Energy and Bechtel. It will deploy 347,000 heliostat mirrors focusing solar energy on boilers located on three centralized solar power towers. The receivers will generate steam to drive specially adapted steam turbines that will generate electricity. Governor Brown’s brief follows a lawsuit filed by the Western Watersheds Project in January 2011 against federal government agencies to block the Ivanapah solar project due to desert tortoises in the area. Three weeks ago, a federal judge denied the environmental group’s application for a temporary restraining order against the project. The environmental group filed its lawsuit against the Department of the Interior, the Bureau of Land Management and the U.S. Fish and Wildlife Service. The environmental group is continuing to pursue a preliminary injunction to halt the project,in eastern California near the Nevada border. The project site consists of 5.4 square miles of high quality habitat for the threatened desert tortoise. “No project can be considered clean or green when it involves destruction of habitat for a species listed under Endangered Species Act on this scale,” said Michael Connor, California director for Western Watersheds Project, which is based in Reseda, California. The site located in relatively undisturbed Mojave Desert near Mojave National Preserve, is prime habitat for 19 other rare animal species including desert bighorn sheep, golden eagles and burrowing owls, and several rare plants in addition to desert tortoise. There are stands of barrel cactus, and centuries-old Mojave yucca. The companies developing the site are placing the thousands of mirrors on poles sunk into the ground, to allow vegetation and tortoises to co-exist with the project. Secretary of the Interior Ken Salazar approved the project in October 2010. 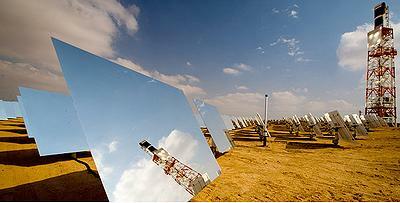 The first phase of the Ivanpah facility is scheduled for completion in 2013. The $2.2 billion power plant project has attracted $1.3 billion in federal loan guarantees and economic stimulus funds. It is expected to create up to 1,000 construction jobs and produce enough energy to power 140,000 California homes. On April 12, Governor Brown signed a bill requiring that one-third of the state’s electricity come from renewable sources by December 31, 2020. “California has set a bold course for its march toward reliance on renewable energy and the Ivanpah project is a very important step in this effort,” the state’s brief reads.